Despite India’s and China’s fast-paced progress in the space industry, some experts believe, that the project of creating a joint piloted station is unviable. In December, during Russian President Vladimir Putin's summit with Indian Prime-Minister Narendra Modi, state leaders confirmed their willingness to cooperate in developing low-orbiting spacecrafts. With growing tensions on the international arena and Russia’s discord with the USA and the EU countries, this idea appears to be more and more relevant for Russia. 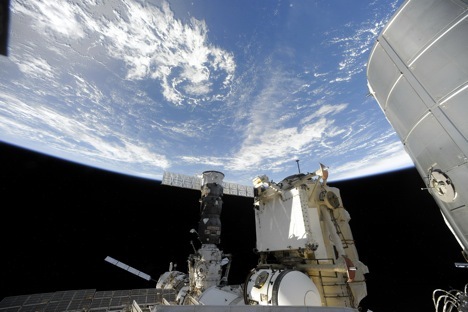 The BRICS’ summit to be soon held in Russia’s town of UFA is expected to see Moscow put forward an idea of creation of a joint manned orbital station in cooperation with New Delhi and Beijing. In view of differences between Russia and the USA regarding further work of the International Space Station, an idea of creating Russia’s national space station has been discussed for a while. The expert council of the Military-Industrial Commission of the Russian Federation has recommended creating “a small target manned station” but it hasn't come to a definite conclusion if it's worth investing in it. According to Aleksandr Zheleznyakov, a member of the Russian Space Academy named after K.E. Tsiolkovsky, said in his comment to the Russian publication “Vzglyad” that this had become a prerequisite for the idea of building a joint Indo-Sino-Russian manned space station. First of all, the project has a political goal of reinforcing space ties with the countries that are “politically loyal” to Russia, like Russia’s strategic partners India and China. Besides, these two countries have been actively engaged in developing manned spacecrafts. But despite India’s and China’s fast-paced progress in the space industry, Russian expert Zheleznyakov is not sure that the project of creating a joint piloted station is viable. Zheleznyakov opined: “At the moment, India doesn’t even have its own manned spacecraft and hasn’t taken part in creation of orbital units.” But he adds that it could be “an opportunity to master the technology of creating large orbital stations” for New Delhi. Ivan Moiseev, scientific supervisor of Moscow Space Club, said that India’s programme of manned space stations is “at its initial stage”. Moiseev expressed his doubts about the station to the “Vzglyad” publication. The expert said that China has its own “programme for many years ahead” regarding construction of its own space station. Moiseev believes that China has already got all the technologies from Russia. Zheleznyakov agrees with him but he doesn’t rule out a possibility of integrating Chinese blocks into the new international station under the condition that “the decision is taken on the political level”. Aleksandr Milovanov, Chief Academic Secretary in Roscosmos, believes that Russian has an additional interest in China as the closest neighbour to the Vostochny spaceport, which could help decrease Russia’s dependency on the Kazakhstan’s Baikonur spaceport. Obviously, Russia places its stakes on this union more from a political rather than technological perspective. Besides, according to Zheleznyakov, it would be difficult to fulfill such a large-scale project on its own, that’s why Moscow is interested in cooperating with Asian giants. The expert also said that the Indo-Sino-Russian station in question would not be able to compete with the already existing International Space Station because “even according to the most optimistic forecasts” it would be put in operation not earlier than 2020-2023.